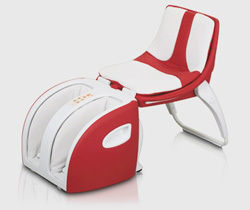 The CUBE is a brand new product from Inada, one of the oldest manufacturers of massage chairs. When we first saw it a couple months ago, it immediately caught our eye with its unique, folding design—which allows it to perform double-duty as a side table or ottoman--and contemporary styling. Compared to larger chairs that can easily run thousands of dollars, we are also impressed with its price ($799). 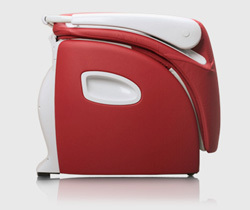 The CUBE provides a shiatsu-style massage to the feet, calves, hips and lower back, using dozens of individual air cells that are inflated and deflated in a choreographed sequence. There are four program options – full coverage; back and hip stretch; legs; and hips and buttocks – along with high and low intensity levels. Each program runs for 15 minutes. In our tests, the air cells of the CUBE provided a natural-feeling massage with a fairly high level of intensity. 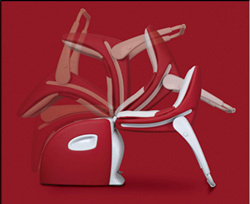 There is simply no comparison between the quality of the massage you will receive in the CUBE and the vibration-based chairs you commonly find in the sub-$1000 category. Noise levels were also low, making it easy to listen to music, read or watch TV while our massage was in progress. Folding and unfolding the chair was simple enough that even my eight-year old could do it (yes, she liked the chair, too!). And moving it into place was also easy with the built-in wheels, though at 48 lbs, carrying it wasn’t that hard, either. The CUBE is offered in black, ivory or red. Its fabric is a functional, polyester-type material that zips off and is machine washable. Currently, the CUBE is available through RichardSolo.com, which is offering $5 shipping and a 30-day return period with pre-paid return shipping.